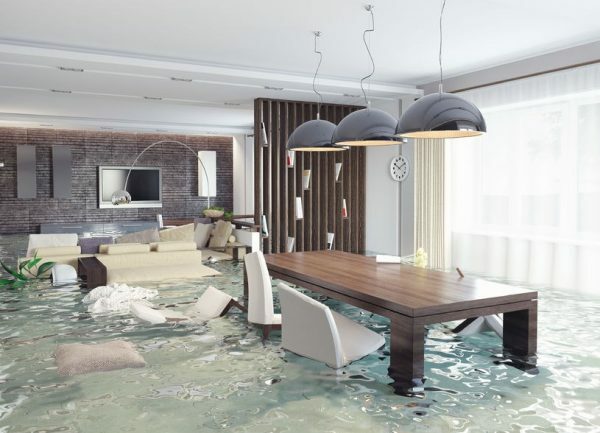 Water damage can occur for a variety of different reasons. There can be a leak in your plumbing, or water can seep into your house from oversaturated soil due excessive rainfall. Standing water can cause issues such as mould and long-term water damage to your house, so it is imperative to begin the cleanup process as soon as you notice flooding in your house. You first decide which aspects of the flooding problem need to be addressed first. Check the room and see where the extent of the damage is. Two important details to note are how far the water has spread and how deep it is. It is good to take a few pictures of the scene as well, for insurance purposes. In addition, if you have someone clean the area later, it will give them a better idea of how much area was affected by the flooding. If there is less water a wet vacuum will suffice to clear it up. For greater quantities, a sump pump can be used. It is crucial to dry the area as much as possible to minimize damages that can occur from the water. In this assessment, it is important to locate what the source of the flooding is. Once you know the source you can determine how contaminated the water is, so you can gather information about how this situation could have occurred. If the water did not come from an external flood, the water the flooding happened internally in the house, from a running on toilet, water pipes, or other leaks inside. The water can be clean, “grey water” or “black water.” Grey water is from spills like from dishwashers, or toilet overflow including urine. It could also be from leaky appliances, water heaters, or issues with plumbing. These sources can make a person sick if ingested, but are not incredibly harmful and can be cleaned with disinfectant to dissipate any risks correlated with the flood. Black water can be toxic and is from sewage or floods from external water sources such as rivers or streams. It is riskier to come in contact with or to ingest. Using gloves and other forms of protection while dealing with these floods is important in order to protect yourself from harmful bacteria and toxins. Once you know the type of water that has flooded your home, you can determine the amount of care you need to take during cleanup. However, in any of these cases there can be issues with mould or mildew if the water is left standing, so even if the water is clean to begin with, you need to be careful of water that has not been dried up promptly. Mould can be removed later, but taking action before its growth begins and spreads can save you a lot of time and headache. Drenched carpets from a flood can be difficult to deal with. Now that you know what kind of water has flooded your house, you can begin to clean up. You don’t necessarily need to pay for a professional carpet cleaner, especially if there is a only a small area that is affected. If it was black water that flooded your house, you should remove your carpets for safety reasons. Carpets attached to the floor should be ripped up. With clean or grey water, you can still clean and dry your carpets, to salvage them. You can make a homemade cleaning solution by mixing 2 tablespoons of liquid bleach with 1 gallon of water. This solution can be used to clean dirty carpets, and help prevent the spread of mould and mildew. After the carpets have been cleaned with this mixture, or another cleaning mixture, you should set up fans to dry them. This is especially important to do for carpets that are not able to be removed from the floor. You can also call a professional carpet cleaner to disinfect them for you. Removing excess water first is always still important to do, to decrease mould growth before you get your carpets cleaned. Ceilings that are sagging or wooden floors may not be able to be fixed by yourself. Some of these issues should be handled by a trusted professional. Calling the right person for the job is important. When you are dealing with water this should be done as soon as possible, before mould can start growing, and before any water damages become more extreme. Sagging floors due to internal flooding can be dangerous as well. Staying clear from the affected area and calling someone who has experience with issues involving these more severe types of water damage can be very helpful. Flooring can be tricky to fix without experience, so calling someone who has done it before would be extremely helpful in getting your house back to its original shape. It can be difficult to know what to do in the case of flooding, but following these steps will help you on your way to restoring your house to its original condition, while staying safe and healthy at the same time.